I know everyone's days are crazy right now. Before the season is over, I snapped a few photos of our home. I apologize for the grainy photos, I was fiddling with the camera's settings and now I don't know how to get it back! I really need to win Pioneer Woman's camera giveaway : ) And, once again, ignore the date...added new batteries and of course it always resets the date. Anyway, I hope you enjoy! Snowmen collection on top of the pie safe. The snow drape is from the Dollar Tree. I just cut it to look like icicles. Most of these have been found at thrift stores during the year. It's funny how cheap they mark Christmas items during the summer! Notice the little gingerbread house under the short cloche...it's an actual gingerbread house about 2" big and it was only $1 at the Dollar Tree!! A mix of vintage and new glass ornaments in the tall cloche/stand that I nabbed at a thrift store about a month ago for $4.99...love it! These little guys (there's three but one is hiding on the other side of the wreath) were a great surprise in a bag of vintage ornaments that I picked up at the thrift store for $2. Vintage Elf on the Shelf figures! A scrapbook embellishment found last year at Big Lots. The typewriter key charms spell out "TWINKLE". This is my large lantern sitting in the foyer. The red bird spray is from the Dollar Tree. The bottom is sprinkled with epsom salt to look like snow. The nutcracker army standing guard in the foyer. I'm hoping there are a few left at Old Time Pottery after the holidays. I'd like to add some of the nutcrackers from different countries that they had earlier this month. I wrapped this book and small wreath with twine. It's in the plate holder hanging above the nutcrackers. Corner of the kitchen. My youngest marked the small chalkboard with "IT'S HERE!" I think she's excited. Another shot of the kitchen. The wooden carrier was picked up at...you guessed it...the thrift store for .49 cents. I repainted it an heirloom white and then distressed it. It's holding a glass snowman platter and small mitten plate. The other corner. I found the Holly Hobby plate at the thrift store. I really like the look of Holly Hobby...I think it should make a comeback. The paperbag snowman was made by my now 19 year old when she was in kindergarten. I carefully store him away every year. On the kitchen island is our baking snowmen and my daughter's gingerbread house. I think you can see a few of the house's decorations are missing...hmmm. wrestling with Sammy our cat to get this. He likes to hang out on the window ledge so when I opened the window, he thought it was an invitation to come in. Sorry Sammy. Thanks for sticking around and I hope you all are greatly blessed. Enjoy your holidays and we'll see you next year! Some of you may have seen the post about my new Etsy shop. Well, I wanted to share with you these adorable snowmen that are so easy to make. I love found objects...game pieces, vintage jewelry, anything rusty, well-loved, and unique. These snowmen begin with a uniquely shaped bottle. Joey is made from a vintage milk bottle. His head is made from a basic styrofoam ball that I covered with tissue paper and Mod-Podge. I didn't want the texture of the styrofoam exposed. His eyes, nose, and mouth are vintage buttons and small brads. I applied a red, vinyl number 3 to the front of the jar﻿ and filled it with beads, tiny vintage ornaments, and buttons. Around his neck is an old ribbon embellished with a vintage milk cap from the antique store. His hat is an aluminum measuring spoon. Once he's assembled, I sprinkled him with white glitter so he would sparkle like snow. I hope you enjoy. These would be great gifts for someone or even a project for kids. Basic jars can be found at the Dollar Tree as well as tiny objects like doll house furniture. Have to share this great giveaway!! 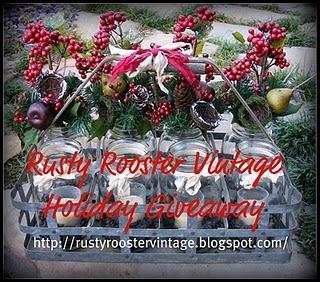 Vicki at Rusty Rooster Vintage is offering a beautiful giveaway this week. As her blog name states, she has a knack with rusty, vintage things...transforming them into beautiful objects for the home. I'm linking to the GIVEAWAY so you can jump on over and check out her blog and the giveaway! I wanted to share one last post about it. These are some of the decorations and preparations I put together for hosting my husband's family this year. We had a wonderful time and God graciously held off the rain while we did our outdoor activities. What? You don't have outdoor activities at Thanksgiving? Okay, more about that later. In the foyer, guests were encouraged to share what they were thankful for by typing their comments on our vintage typewriter. Since we had about 30 attending, I had several tables set for eating...one in the bonus room. I love the colors in this table cover. It's actually a curtain panel but it worked so well in the bonus room, I had to use it. I should really invest in some slipcovers for the folding chairs. Maybe next year. The lanterns were a thrift store find for .49 cents each. I used the LED tealights from the Dollar Tree inside each. These are perfect for rooms that may not always be occupied...therefore, the candles would be left unattended. Here's a look at the whole room. I transformed my dining-room-turned-craft-room/office BACK into a dining room for this past Thursday. It's my favorite room...probably because so much of what is in there is "me" items. It's usually a "cornucopia of stuff" but I was able to hide store neatly everything until after the holidays. The copper candlesticks were from a thrift store as well as the acorn wire basket. The mercury glass acorns inside were purchased on clearance at Pier One several years ago. Love them!! Here are a few other items I found a few weeks before Thanksgiving. I needed something to put dishes on that was functional and nice to look at. I found this great black crock stand, already painted black which looks great with the ironstone. I saw a post at Vignette Design blogspot on pumpkin windowboxes that was BEAUTIFUL! So, having found a windowbox...at the thrift store, of course...Mr. Wonderful (hubby) installed it underneath my kitchen window and I filled it with all sorts of fall goodies. The window is on the second story so it was a little difficult to get it to look just as good from the driveway below as it did from the kitchen. Oh, and back to the outdoor activities. Usually, my husband's side of the family plays a good, competitive game of kickball. This year, since we hosted, we did what any Southerner would do...pumpkin shootin'! ﻿What? Your family doesn't do this?! Lol, it was a first for us as well. We had intended on making a trebuchet or giant slingshot for punkin' chunkin' but time ran out and this was our plan B. I'm really, really hoping for a nice pumpkin patch next year. I'll let you know how it goes. Well, I know this is a day late but I had to post a few photos of our Thanksgiving. These are a little random because as the day grew closer, I became a little less organized and remembering to take pictures was often forgotten. But, here's what I did get! Paula Deen's Good Ole Country Stuffing...yum! I﻿ really enjoy a lot of Paula Deen's recipes. I just can't afford to eat them often. You know she has a love of butter and all kinds of good, fattening ingredients. This stuffing is delicious and I've made it for the past three years. It includes 3 different breads/starches...2 loaves of Pepperidge Farm bread, 1 sleeve of saltines, and 2 cups of cooked rice. Mmmm...mixing in all the goodness. It does make one dirty pan. However, I have a secret. Well, it's really not a secret. It's really not even my idea...originally. Have you ever been to a Japanese restaurant where they cook at the table? Have you ever noticed how bad the grill looks when they're finished cooking? Well, this is where I got the idea to clean my stainless steel skillet. While your pan is still hot, pour in enough water to cover the bottom and let it come to a slight boil. With a plastic spatula, begin to remove the mess that is stuck to the bottom. It should lift off very easily. You can turn the stove off at this point. Next, clean with dish soap as usual. Ta-da! Clean! I love this method. So much easier than trying to scrub it after it has cooled. Here's a couple of other dishes I managed to get a picture of during the day. 'Nanner Pudding! From scratch...no boxed pudding this is dish! Another Paula Deen recipe...Pumpkin Gooey Butter Cake and I do mean butter...2 sticks! The crust made from yellow cake mix and, of course, butter! After the crowd began the dessert line, I managed to get a picture. One last "dish"...my new kitchen beadboard. I began sprucing up my kitchen a few weeks ago...in preparation for the Thanksgiving guests. Originally, there was just painted walls under the cabinets. Here it is after installing beadboard and brackets. In case you're wondering, my daughter decorated the dog treat jar with paper candy corn and paw prints!